He half expected the engine of the red BMW Z3 roadster to groan in embarrassment at being seen by the other sports cars zipping past in the left-hand lanes. But in the aftermath of his dizzy spell at the airport, he couldn’t risk going any faster. He rarely drove a car. At home in New York, the Darcys’ household staff included a driver, and William’s performing trips usually took him to large cities best navigated with in a hired limo. But the word “California” summoned up the irresistible image of a convertible zipping down a sun-soaked freeway. Richard deserved the credit, or the blame, for this association. William had been a timid nine-year-old when his aunt and uncle, the Fitzwilliams, moved from San Francisco to New York with their son, whose confident swagger and worldly attitude had dazzled his cousin. William had especially enjoyed Richard’s tall tales of life in California, many of which involved joyriding in fast cars. The stories were probably invented; thirteen-year-old Richard had been too young to drive. But by the time William recognized this contradiction, his itch to cruise California in a hot car was deeply entrenched. Some might think it silly to gratify such a frivolous whim—his grandmother headed that list—but he allowed himself this harmless vice. By now, his secretary knew the owner of every exotic car rental agency from San Diego to San Francisco. Had he known that he’d have to rein in the engine rumbling under the hood, he might have asked Sonya to arrange for a limo instead. But the weekend had just begun, and he was already feeling better. Fresh air and sunshine, and maybe some rest; that’s all I need. Half an hour ago he hadn’t been so optimistic. As he had leaned over the luggage conveyor to retrieve his suitcase, the world had dissolved into near blackness. He had needed every ounce of his concentration to stay on his feet while he searched for a place to sit and rest. He had been curt with the fan who had approached him at the worst possible moment, but it would have been unthinkable to confess his weakness by saying, “Pardon me, but if I don’t sit down I’m probably going to fall in a heap at your feet.” Besides, what is this, “Accost William Darcy” Day? He had barely recovered from his encounter with Linda the Webmistress and her photographically-challenged spouse. And they weren’t the only ones who had recognized him; so had the girl with the green eyes. During his struggle to regain his equilibrium, her eyes had flashed in his direction, their former good humor replaced by chilly disdain. He shrugged. It didn’t matter; she was a stranger, someone he would never see her again. He steered the Z3 onto Highway 101 and pressed the gas pedal. The car leapt forward like a thoroughbred bolting toward the finish line, and for the first time that day he began to relax. William arrived at the Ritz-Carlton’s Terrace Restaurant at precisely one o’clock. He felt like the living embodiment of the expression, “a new man.” A short nap, a shower, and a change of clothes had wiped away the last remnants of his terrible morning. 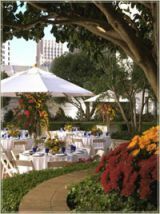 The maitre d’ showed him to a table shaded by a canopy of trees. He stretched his long legs and alternated between perusing the menu and gazing absently at the fountain in the center of the terrace. Its gentle splashing sounds underscored the soft hum of voices from nearby tables. Several minutes later, he sat sipping a glass of iced tea and devouring a small loaf of warm sourdough bread. He glanced at his watch; as he looked up, he saw Charles Bingley striding briskly across the terrace, wearing a broad grin. Charles ignored William’s outstretched hand and instead enveloped him in a bear hug. William shifted on his feet and tentatively thumped Charles on the back. “You are so full of it.” But Charles wasn’t that far from the truth. Such superficial admiration couldn’t compare to the appreciation of a true classical music aficionado. But William was revered by that audience too. Besides, as Richard was fond of pointing out, symphony orchestras didn’t make that distinction when William’s guest appearances attracted sellout crowds. “Yes, I do.” William delivered this news with a smug smile. “Here’s the real test. How often do you check your e-mail?” Charles asked, quirking an eyebrow. “Nothing in particular.” William developed a sudden interest in studying his glass of iced tea. “‘Plenty’ is a strong word.” William studied a tiny gray bird hopping toward him, nibbling breadcrumbs fallen from a nearby table. “He didn’t,” Charles murmured in a conspiratorial tone, leaning forward. “But you can’t do that,” William replied, shaking his head. Their lunches arrived, and they ate in silence. William appreciated Charles’s happy-go-lucky nature, though it was entirely different from his own, and he had never felt any compulsion to change. But Charles had never quite grown up. He fell in love easily and often unwisely, and got his heart broken with predictable regularity. His deception regarding the pre-nup was a disaster waiting to happen. “A Z3.” William swallowed a bite of his salmon. The waiter returned and cleared away the plates. Both men refused dessert and coffee. William, over Charles’s protests, charged the lunch to his room. “Got any plans this afternoon?” Charles asked. William smiled as he led the way out of the restaurant. Eat your heart out, Richard. You made up the stories, but I get to experience it for real. Elizabeth leaned back on her elbows and surveyed the scene. The weather all blue skies and sunshine on this afternoon in May, matched her breezy mood, as did the location she and Jane had selected for their impromptu picnic. 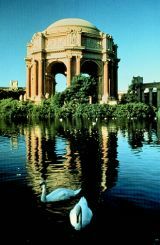 The Palace of Fine Arts was all that remained of the Pan-Pacific Exposition of 1915. 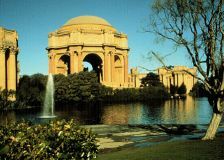 The elaborate central rotunda with colonnades housed, not an art museum as the name suggested, but the Exploratorium, a hands-on science center. As a child, Elizabeth had loved visiting the grounds to feed the ducks and swans swimming in the lagoon, and to search for turtles sunning themselves on its banks. Today she and Jane reclined on the gently sloping lawn overlooking the lagoon, the remnants of their lunch spread out between them. “Right. I’d hate to have to give it up now, when I’m finally starting to get establishedl.” Jane fell silent, staring at her flawlessly manicured fingernails. “Not really. Mr. Bingley started asking questions about our family. How much money Dad makes, what Mom did before she met Dad, how much our house was worth, and things like that. I thought the questions were …” Jane paused. “Nosy? Rude? Obnoxious?” Elizabeth spat out the words. “We were only broken up for one day. 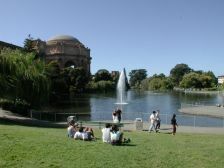 Then Charles came to see me, and he assured me that everything was worked out; we were staying in San Francisco. And the Bingleys must have decided I wasn’t a fortune hunter, because they never even asked me to sign a pre-nup. It seemed like everything was fine again, and I decided to put it behind me. But now …” Jane paused and bit her lip. A trio of children stood at the edge of the lagoon feeding the ducks, who quacked their urgent demands for a second helping. The warm afternoon sun baked into Elizabeth’s winter-pale skin. Her eyelids drooped as her early morning began to take its toll. She started slightly when Jane spoke. “Hmmm.” Elizabeth’s budget hadn’t allowed for a new dress, so she had conveniently forgotten this information. “Besides, you’ve got a fabulous body and you always insist on hiding it.” Jane directed a narrowed glance at Elizabeth’s loose-fitting blouse and long skirt. “And we can play Fashion Mistake if you want,” Jane added in a wheedling tone. Elizabeth had invented the Fashion Mistake game as a teenager. They each picked a disastrous outfit for the other to try on. She chuckled, recalling the fashion mistakes—or more appropriately, cataclysms—she had inflicted on Jane in the past. Unbidden, a pair of intense brown eyes flashed intoElizabeth’s mind. She shook her head quickly, dismissing the image. “As if I care about William Darcy,” she said blithely. “We’re just a block from the house now,” Jane said, excitement rising in her voice. The shopping expedition had been a success. Elizabeth had calculated that a few extra shifts at the restaurant would be enough to pay Jane back for her new dress and shoes. She couldn’t accept charity from Jane, not even in the guise of a bridesmaid’s gift. “Well, what do you think?” Jane pulled her car into the driveway of a three-level Victorian house. “Maybe it’s a surprise wedding present from Charles,” Elizabeth said, her eyes twinkling. “I love my Honda.” Jane patted the dashboard fondly. “Did you see the Sub-Zero refrigerator?” Jane sounded like a small child on Christmas morning. Jane led Elizabeth through the rest of the house. Afternoon sunlight streamed through the windows, tinting the rooms with a warm glow. Jane’s taste was evident everywhere: serene and unpretentious, yet utterly chic. Elizabeth trotted down the stairs and stepped through the French doors to the patio. Voices floated up from the yard below. Jane had mentioned Charles’s plans to have lunch with William Darcy. Apparently they had returned here after lunch. As if insulting Jane at the airport wasn’t enough, now he was trying to interfere with the wedding! “I hope you know what you’re doing.” William sounded dubious. Elizabeth rolled her eyes. Don’t worry, Mr. Darcy. I’d rather curl up with a rattlesnake than hang on your arm. “Oh?” William packed a gallon of arrogance into that one syllable. Elizabeth stifled an indignant gasp. Elizabeth missed William’s answer, distracted by footsteps behind her. She turned and saw Jane approaching, a tote bag over her shoulder. “Shhhh! Not so loud!” Elizabeth whispered, but it was too late. William stood at the foot of the steps and studied Jane. She looked familiar, but he couldn’t place her. Then Charles’s earlier words drifted through his head: “Jane went to meet her sister at the airport.” The pieces of the puzzle fell into place with a sickening thud. She hadn’t approached him for an autograph; she had been trying to introduce herself. Then he remembered Jane’s companion at the airport, and his embarrassment turned to mortification. She was standing beside Jane, hostility blazing in her eyes. Her green eyes. He dragged himself up the steps, wishing for the San Andreas Fault to open and swallow him. That seemed the only possible escape from humiliation. By the time he reached the patio, he had managed to don an aloof expression. He nodded. “Hello.” He couldn’t remember the last time he’d felt like an awkward 14-year-old. “Hello,” she snapped, her eyes two cold, glittering emeralds. William struggled to find something to say. “Lizzy is the maid of honor,” Jane said, filling the awkward silence. Elizabeth glared at him, an imperious challenge in her eyes, and he sensed that she was daring him to speak. “Then … um … I suppose we’ll be seeing a lot of each other this weekend.” William nearly groaned. He sounded utterly inane. For a moment, her cheerful tone lulled him into believing that she intended the remark as a good-natured tease, but his relief was short-lived. Although her lips wore a smile, her eyes were cold. He looked away, his expression a dispassionate mask. “All right, if that’s what you want,” Jane said. “Charles, it’s wonderful to meet you at last,” Elizabeth said, smiling warmly. “I’d happily wear a blindfold for a good cause,” Charles said cheerfully. He pulled Jane into his arms for a kiss. William glanced at Elizabeth, who wore a wistful expression as she watched her sister. She must have sensed his gaze, because her eyes met his and her expression hardened. Charles escorted Jane and Elizabeth to their car, leaving William alone on the patio. He was grateful for some time to think. He reminded himself of Elizabeth’s occupation, her youth, and her Lower East Side address. A pair of exquisite green eyes changed none of that. Besides, she was by no means a beauty like her sister. She was pretty, but she lacked the elegance and sophistication of the women he encountered socially. Furthermore, her sarcastic tongue and quick temper were unattractive traits. He would be polite to her, but no more than that, for the rest of the weekend. Then he would return to New York, separated from her by a wide gulf of wealth and privilege. Back in familiar surroundings, it would be easy to stop thinking about her. He was quite certain of that. 1 The Brady Bunch: a 1970s comedy series on American TV about a blended family with six children.